See you on the 29th Matt. Good to hear from you again. All the best for your book launch. I ordered it as soon as I knew you had written it. As I read your words again I am reminded of your incredible writing and use of the language, the love you and Lecretia had in your lives together and the incredibly deep sadness you now live with every day. I know your book will be amazing and it is fantastic to hear you have been invited to the Australian writers’ awards. I am so hoping that the politicians will see past the church groups who have put in submissions, as you say, probably after fire and brimstone sermons. It isn’t right that a church leader should try to influence the thinking of his/her congregation, the same as teachers should be value free. 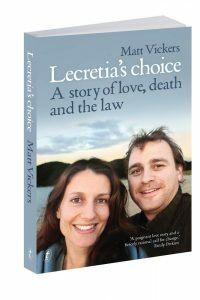 We all need Lecretia’s Choice to become law. It is after all a choice, not a given, that if you become terminally ill you’ll automatically have to end your life. I would love to attend your book launch at Parliament but we will be looking after Sarah and Damian’s children so that they are able to come. It is so wonderful to know that you are still very much involved in your quest Matt, and that Lucretia is still very much in your thoughts….bless you, and I wish you success and contentment.